Dr Stephen Chang is a general surgeon practising at Mount Elizabeth Hospital, Singapore. He is also the medical director of the liver programme at Mount Elizabeth Hospital. He subspecialises in laparoscopic surgery, management of gall bladder, liver and pancreatic diseases, and liver transplantation. Dr Chang graduated with a Bachelor of Medicine, Bachelor of Surgery at the National University of Singapore (NUS) in 1994 and obtained his Master of Medicine (Surgery) in 2000 from NUS. Having become a fellow of the Royal College of Surgeons of Edinburgh, UK in 2003, he furthered his training in laparoscopic hepatobiliary and pancreatic surgery, and liver transplantation in Paris, France. 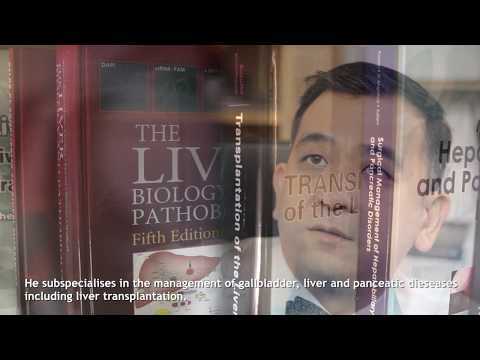 Dr Chang was a key developer of the laparoscopic approach to hepatobiliary and pancreatic surgery and has been active in developing the living donor liver transplant (LDLT) programme at Mount Elizabeth Hospital, Singapore. He also pioneered the single incision laparoscopic surgery (SILS) and was the first few to publish his experience in single incision laparoscopic gall bladder surgery, liver resection and pancreas resection. Dr Chang is the founding president of the Hepatopancreatobiliary Association of Singapore and an adjunct associate professor at the Yong Loo Lin School of Medicine in NUS. Aside from his practice at Mount Elizabeth Hospital, he is also a visiting senior consultant to the Division of Hepatobiliary and Pancreatic Surgery, University Surgical Cluster at the National University Hospital (NUH). Academically, Dr Chang's research interests not only include clinical research but also basic science and medical technology (medtech) development. He has held numerous research grant awards totalling more than $7 million to develop new surgical techniques and treatment modalities through medical technological initiatives. He has extensive publications in both clinical and medtech research and has since filed 5 patents in these areas. With these endeavours, he hopes to improve the care of patients. With improved surgical techniques and better understanding of the liver regenerative process, there has been an exponential rise in the number of patients undergoing living donor liver transplant. The painful symptoms of gallbladder stones are very often mistaken as gastric pain. Single-incision laparoscopic surgery (SILS) is gaining ground over conventional laparoscopy or keyhole surgery by decreasing postoperative pain and offering better cosmetic results. What is Single Incision Laparoscopic Surgery?